When marketing an attorney online or other business professionals on the Internet, there are many important considerations to weigh out when developing your online Web presence. Domain name strategies and online branding should be prime considerations for marketing your business profession. Your first consideration that needs to be addressed online is your brand image. In the age of the Internet, domain names and branding are intrinsically linked together. 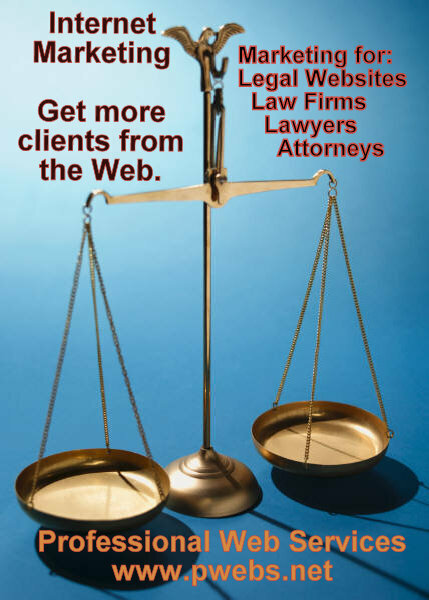 If you are an attorney, consider the following article information for your website presence. While, you may want to start building up your law firm’s name for your business profession by including your law firm name in the actual domain name; this may not be the best or only solution for a professional to begin with. Many times professionals such as lawyers, are placing their website placard on the Internet, without a good understanding of the marketing concepts involved online and expecting that is all they need to do to promote themselves. For example, many of the attorneys’ websites I have seen online give general descriptions and typically no locations of their business listed on the home page. If I am a consumer looking for an attorney in my city, how likely would I do a global search of the entire USA and world for “attorney” on Google Search? Let’s be realistic here, most people want a local attorney that can give them the personal touch, and one that can handle whatever the local issues are. They don’t want to use someone to represent them hundreds or thousands of miles away from their local needs. Likewise, if I need a lawyer’s service in another town or a distant state, I would want to find a local lawyer who can help me in those local towns and distant state locations. Again, let’s take the attorney professional as an example, and look at what they would need to do when picking a domain name for their legal profession. Actually, you might want to have two domain names with very distinct and different information on both websites, though having unique content on each site is critical from a search perspective. It would not be a good idea from an SEO perspective to have both websites saying the same exact things. One website might have the actual law firm name of the law practice in the URL, while the other site could have the name of the legal specialty practice in the URL. Consider for a moment, how the Internet is shaping the way businesses and consumers find information today. Refer to: Online Marketing Tips for Attorneys and other Legal Professionals, below, for more pointers. Most people look to the Internet first and foremost with searches for all types of professionals, before they even open up their Yellow Pages phone book to look for a professional or an attorney. Heck, most people never use the Yellow Pages anymore except on rare instances, and certainly the younger generation hardly even picks up the Yellow Pages even once a year. A person searching online is very likely to type in the name of a local city, with the word “attorney” or “lawyer” after the city name, when doing a Google Search. These search engine results pages would reflect the use of those keywords specific to the city being searched for. This is true for other searches too. A person would much more likely find the particular profession they are looking for by typing the city in addition to the keyword, attorney or lawyer. OK, what about all the different areas of law practice? How do the areas of law affect your search results online? For example, take a look at the long list of attorneys that specialize in a particular branch of law. If you are an attorney, how do you differentiate your law practice from the thousands (actual number of attorneys is well over one million) of attorneys online? To really distinguish yourself online today, requires using the keywords related to your legal profession. Most attorneys are specializing in one or more of the areas of law practice but not all. Simply telling your specialty one time in a website, is probably not going to help your branding efforts online, nor, will the small effort of publishing it once help get your website found in the general search results pages. You need to think like a marketing person, instead of as a attorney, when it comes to promoting yourself on the Web. In fact, you have to think of yourself as the client, and think how new clients would go about searching for your legal profession specialty on the Web. You need to know your clients semantically. Then the next requirement is the website needs to have good copy writing — actual body text (not just the website graphics) that reflects the way your clients think and talk. Get down to earth. Speak your clients’ language. Tell it like it is, and do it with style! Consider having two websites, both your law firm name as the domain name for one, and another domain name for additional information and writing within your area of expertise. Must have unique information on each website. Use your local state and city names in your website copy writing. Include the keywords related to your legal profession throughout the website. Make sure your website is both a marketing and advertising tool that is search engine friendly, one that can be found in the search engine results pages for your local practice areas. Don’t just get lost in the myriad of online legal directories in which people have to go searching for, in order to find your name or someone else’s name. Start building up your online brand in your location today. Promote yourself with a website blog. Blogs are simply a means of easily sharing with readers what is happening in your area of expertise. Note: One of the two domain names from above could be your blog website URL. That way, you could simply update it anytime you wanted and provide additional marketing and advertising channels online, with quality links back to your main legal website. Incorporate your brand architecture across all online market channels. In essence, make it known online that the two websites are yours (your brand) and promote that fact (the websites don’t need to look the same). Advertise in your local markets online. Set aside an advertising budget. Google AdWords and other online advertising channels should be serious considerations for marketing and advertising online. Build quality web pages that can be used for advertising and sales landing pages. Stay in touch with your clients through email campaigns and reach out to new clients with automatic sign up pages for more information. Consider again, writing a blog on the general subject matter and legal practice. A blog can gain you extra traction online. The above pointers are things to consider going forward. Don’t get lost in the details. Start first with a quality website, one that is search engine friendly, and go from there. Need help with your legal marketing? Professional Web Services knows what it takes to get you found online today. Set your brand apart. Contact Professional Web Services for a website analysis and establish a great brand online today. Remember, your profession is your business, so now is the time to get found online.